ICNC offered a moderated online course: “People Power – The Study of Strategic Nonviolent Resistance” in partnership with the International Institute for Peace at Rutgers University Graduate School, which took place from September 25 to November 10, 2017. This was the fifth year that ICNC has run this course. Read more about the 2017 course and assessments below. You can also view assessments from previous courses in 2016, 2015, 2014, 2013, 2012. In 2017, ICNC received 182 applications for the People Power online course. The quality of applications was high and it took three rounds of reviews to select the 64 participants who were invited to take part in the online course. Among those 64 accepted applicants there were 36 females, 27 males & 1 two-spirit from 30 countries. Most of them were mid-level professionals, a number of them were experienced civic organizers and activists. A handful had journalism experience, or were NGO executives. Many of them engaged in academic work, usually in conjunction with other activities such as organizing. The surveys conducted during the orientation webinars before the course began showed that the participants wanted to gain practical knowledge on how to organize civil resistance campaigns more effectively, as well as learning about general dynamics, concepts and cases of civil resistance. The participants also wanted to share their own on-the-ground experience with other learners. A new feature this year was the interactive group work that participants engaged in. Participants completed this work during Modules 2, 4, & 6. Their work consisted of answering discussion questions, holding video conferences, and developing a summary/statement regarding the content in each respective module. The course also included two exclusive webinars. The first webinar, “Creative Strategies for Civic Mobilization” was with Ivan Marovic and included time for course participants to ask questions and have a discussion on the webinar’s content. The second webinar, “Armed Flanks & Civil Resistance” was with Dr. Kurt Schock and also included a time for questions and discussion. Forum discussions were a key component of the course, with 341 discussion posts in Module 2, 373 discussion posts in Module 3, 298 discussion posts in Module 4, 302 discussion posts in Module 5, and 200 in Module 6. For the second year, ICNC had Academic Advisers who moderated the various discussion forums, adding an important value to the overall educational experience and a recognition to the course standing. The course moderators included: Dr. Erica Chenoweth, Dr. Kurt Schock, Dr. Jason MacLeod, Dr. Mary King, Dr. Stephen Zunes, Dr. Veronique Dudouet, Dr. Maciej Bartkowski, Dr. Steve Chase, Azaz Elshami and Amber French. Course instructors provided summaries of the forum discussions in a particular module, highlighting key points made, debates taking place and core information that was shared. For the first time, course participants were given group work as part of the online course. There were eight groups total that participants were in. In Module 2, participants held group discussions and a video conference to discuss civil resistance’s portrayal in the media. Following these discussions, each group drafted a summary of their conversations and shared it with the other groups. Participants continued their group work in Module 4. They held an online discussion and video conference to discuss Gene Sharp’s 198 methods of civil resistance. After doing so, they created a group summary and shared their conversations with other groups. The groups in this module held online discussions and video conferences to discuss anti-corruption campaigns. Their final group assignment was to develop a strategy for an anti-corruption campaign and share it with the rest of the groups. 38 participants completed both the pre and post course learning gains survey. Included below are the graphed responses to selected questions from the learning gains survey (conducted among the same group of participants that took both surveys) that demonstrate the extent of the knowledge improvements that is assessed based on participants’ knowledge base prior to taking the course and after they completed it. On a scale of 1-5, please select the number that best represents your current knowledge of civil resistance or nonviolent movements. On a scale of 1-5, select the number that best represents your view that revolutions against brutal regimes can succeed ONLY if revolutionaries retain the option to use violent means. On a scale of 1-5, select the number that best represents your view that protests, marches, and demonstrations are the ONLY civil resistance methods. On a scale of 1-5, select the number that best represents your view on how successful you think civil resistance campaigns against repressive states have been in the past. On a scale of 1-5, select the number that best represents your view that movements that face repression must fail. On a scale of 1-5, select the number that best represents your view that in order to be successful nonviolent movements must receive support from external actors, have access to the Internet, or face a regime that is weak and divided. On a scale of 1-5, select the number that best represents your view about how important you think strategic planning is in a successful civil resistance movement. On a scale of 1-5, select the number that best represents your view about how important you think participation is in a successful civil resistance movement. On a scale of 1-5, select the number that best represents your view about how important you think nonviolent discipline is in a successful civil resistance movement. This was a short answer question and is not included in this report. How do you envision applying the knowledge that you gain from this course? More than 79% of participants who completed the post-seminar survey selected 4 or 5 in comparison to 23.7% of participants who selected 4 or 5 in the pre-seminar survey. This reflects a 55.3% increase in civil resistance knowledge. 31.6% of pre-seminar respondents selected 2, whereas none of the post-seminar respondents selected 2, showing a decrease in misconstrued knowledge about civil resistance. 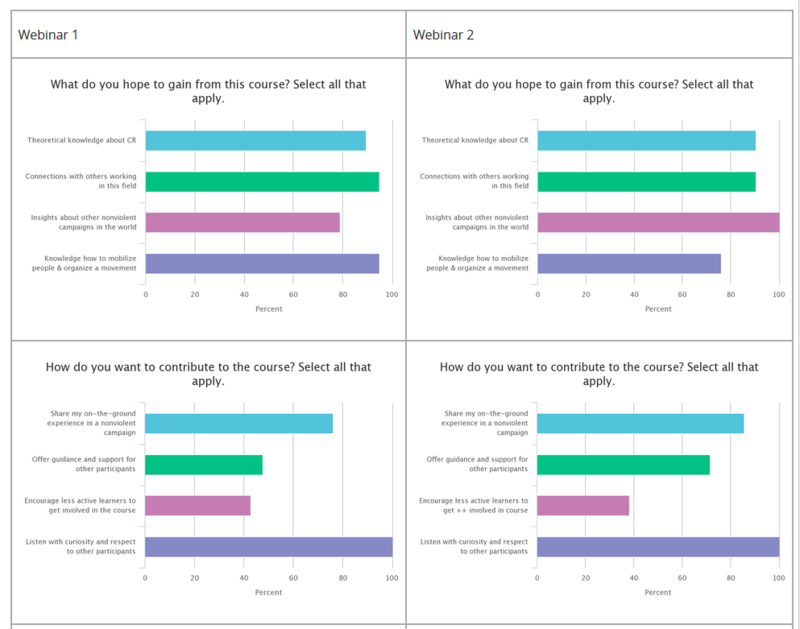 84.2% of participants who completed the post-seminar learning gains survey chose 4 or 5 in comparison to only 31.6% of participants who selected 4 or 5 in the pre-seminar learning gains survey. This reflects a 52.6% increase in civil resistance knowledge. 29% of pre-seminar respondents selected 1 or 2 whereas none of the post-seminar respondents selected 1 or 2, showing a decrease in misconstrued knowledge about civil resistance. 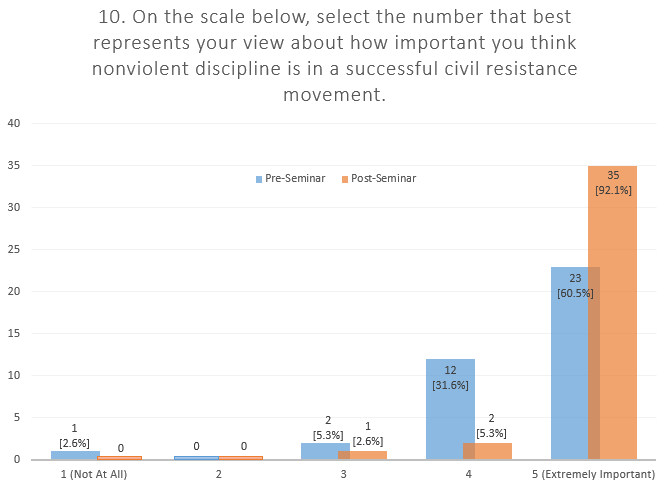 18.4% of pre-seminar respondents selected 1, 2, or 3, whereas none of the post-seminar respondents selected 1, 2, or 3, showing a decrease in misconceptions about civil resistance. 97.4% of participants who completed the post-seminar selected 4 or 5, as compared to 69.8% in the pre-seminar survey. This reflects a 28% increase in civil resistance knowledge. 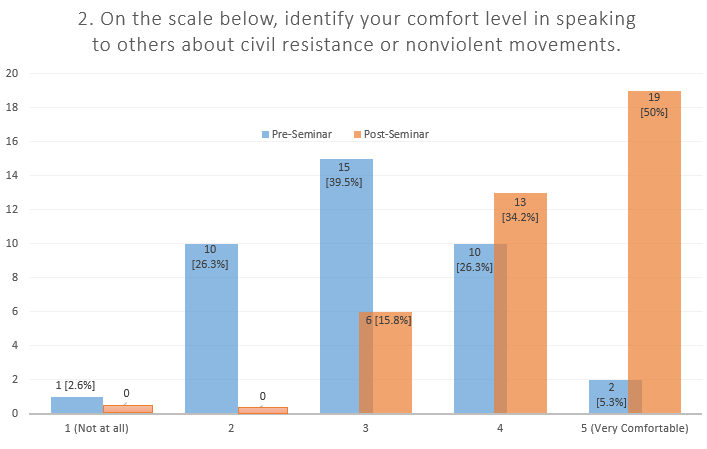 94.7% of participants who completed the post-seminar survey selected 4 or 5, as compared to 55.3% in the pre-seminar survey, reflecting a 39.4% increase in civil resistance knowledge. 44.7% of pre-seminar respondents selected 1, 2, or 3 whereas only 5.3% of post-seminar respondents selected 3 and none of them selected 1 or 2, reflecting a 39.4% decrease in misconstrued knowledge about civil resistance. 94.7% of post-seminar respondents selected 4 or 5, as compared to 84.2% of pre-seminar respondents, showing a 10.5% increase in civil resistance knowledge. 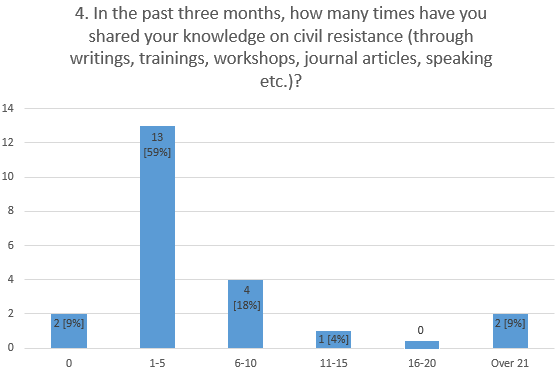 60.6% of post-seminar respondents selected 4 or 5, compared to 55.4% pre-survey respondents, showing a 5.2% increase in civil resistance knowledge. 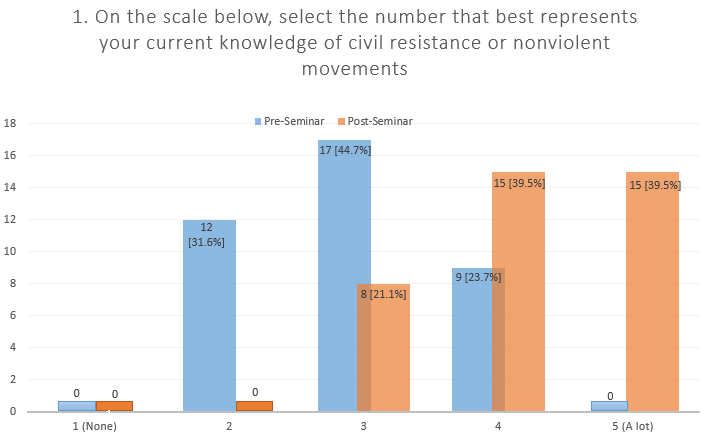 100% of post-survey respondents selected 4 or 5 compared to 94.8% of pre-seminar respondents, showing a 5.2% increase in civil resistance knowledge. 100% of post survey respondents selected 4 or 5, as compared to 92.1% of pre survey respondents, showing an 8% increase in civil resistance knowledge. 97% of post survey respondents selected 4 or 5 as compared to 92.1% of pre survey respondents, showing a 5% increase in civil resistance knowledge. 97.4% of post survey respondents selected “Yes” as compared to 89.5% pre survey respondents, showing a 7.9% increase in civil resistance knowledge. Participants were able to choose multiple answers for this question. 86.8% of pre and post seminar respondents plan to use their knowledge from the Rutgers course in teaching education or training others. 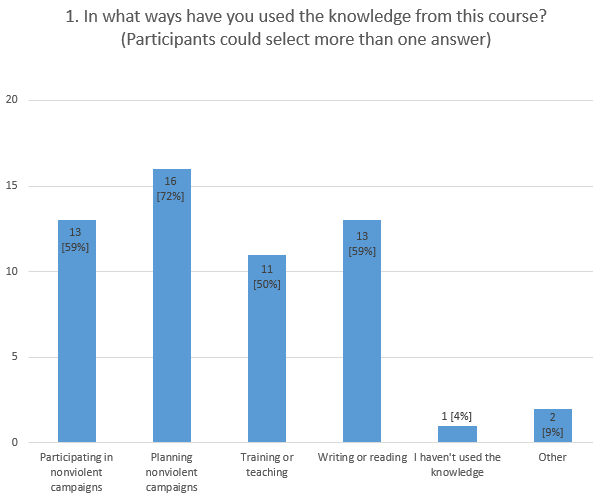 84.2% of post seminar respondents plan to use their knowledge in a nonviolent campaign. 41 course participants completed the final evaluation. See below for selected graphs from the evaluation showing participant’s responses. 94% of course participants selected 4 or 5 for this answer, indicating that almost all of the participants found the module and course goals to be clear. 92.6% of course participants found the ICNC Rutgers course to be a positive experience. 95% of course participants selected 4 or 5, showing that the course met or exceeded the expectations of almost all course participants. 97% of course participants said that they would recommend this course to other people, indicating the high rate of satisfaction that participants had with the course. 98% of course participants found the course content to be relevant to their current and future work and study. 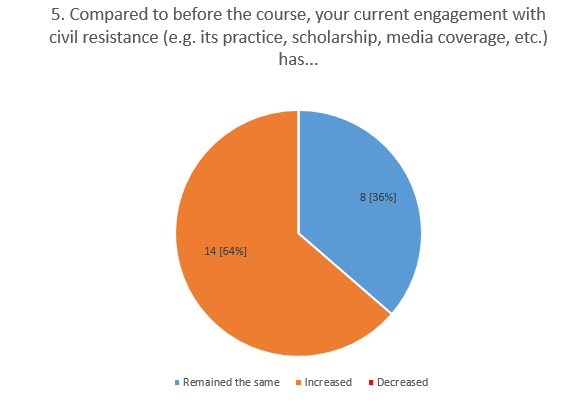 In order to measure the long-term impact and effectiveness of our online courses, ICNC sent out a follow-up survey three months after the 2017 Rutgers course ended. 22 participants completed the follow-up survey. Please see below for selected graphs. In what ways have you used the knowledge from this course? Compared to before the course, how interested are you in learning more about civil resistance? In the past three months, how many times have you participated in a civil resistance action? In the past three months, how many times have you shared your knowledge on civil resistance (through writings, trainings, workshops, journal articles, speaking etc.)? How many times did you return to the ICNC-Rutgers online course to consult its materials, posts and other information after the end of the course? After the past three months, how relevant and/or valuable do you find your learning gains from the ICNC-Rutgers course? 72% of survey respondents had used their knowledge in planning nonviolent civil resistance campaigns. 59% had used their knowledge either in participating in nonviolent civil resistance campaigns or in writing/reading. 73% of survey respondents reported that were more interested in civil resistance. None of the survey respondents reported that they were less interested in civil resistance. 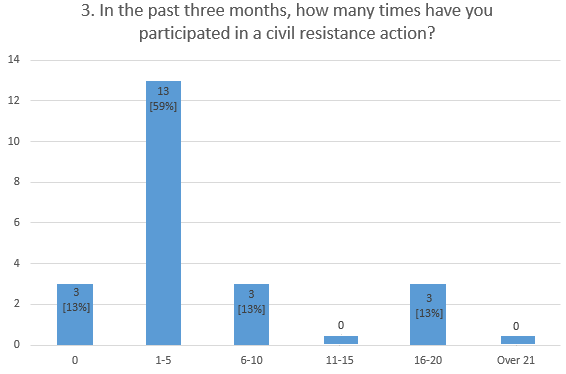 59% of survey respondents had participated in a civil resistance action in between 1-5 times. 59% of survey respondents had shared their knowledge (through teaching, writing, etc.) 1-5 times. 64% of survey respondents said that their engagement with civil resistance (e.g. its practice, scholarship, media coverage, etc.) had increased. None of the survey respondents reported that their engagement had decreased. 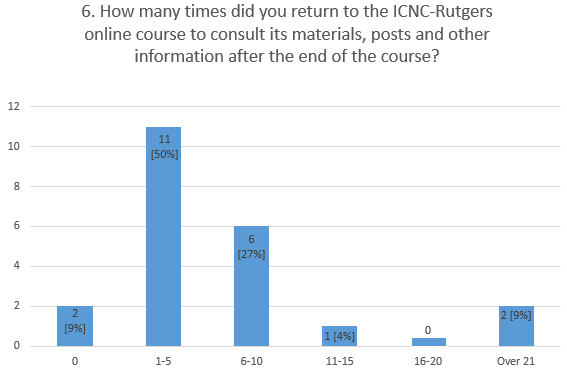 50% of survey respondents returned to the ICNC-Rutgers online course between 1-5 times to review its materials, videos, posts, etc. 50% of survey respondents reported that their learning gains were still valuable/relevant to them. 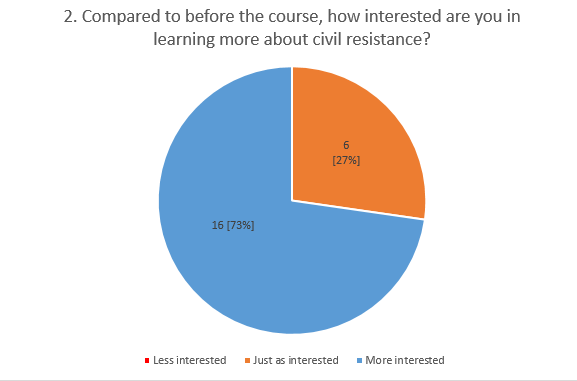 Overall, survey respondents indicated that they were more interested in civil resistance three months after the course had ended than when the course began. A majority of them reported that they were either engaged in civil resistance campaigns or in teaching civil resistance to others. Almost all of the survey respondents had consulted the ICNC-Rutgers at least once in the three months since the course ended.